Build as city 1 but without the warehouse giving you space for 1 more barracks. After city 2 you can build iron or wood cities if you wish or build all cities the same as city 2, the choice is entirely yours. When you have built the relief station to level 9 you can demolish the stable in every city and build an extra barrack,this can also be done with the forge when all your gear is level 10. There is also no need to keep your inn in every city as you can either capture or recruit heroes in one city and send them to the required location. These are built to raise your population.There need to be 6 to 7 cottages in your village and each one needs to be at level 9. This needs to be built up to enable you make resource field but be warned taking this to level 5 before your 7 days beginners protection is over can be a mistake unless you have the troops to defend yourself. The feasting hall is where your heroes are housed and the higher the level of your feasting hall the more heroes you can house.The maximum amount of heroes that can be housed is 10 but your Queen or King can be housed in any feasting hall without taking up a space. This is where you recruit your heroes from.The higher the level of your inn the bigger choice of heroes you are given.The choice of heroes given in an inn is relevant to the size of the inn but the higher the level of your in can also mean higher level heroes being available at a higher cost to yourself in gold. This is what allows you to send attacks either to other player or to valleys or npcs.You are allowed 1 attack per level and 10000 troops in an attack per level so the higher the level the more affective your attacks become. This works with a duel purpose both allowing you to see what incoming troops you have heading your way when your being attacked but also giving you better scout reports from other players. The market is where you buy and sell resources,the higher the level of the market the more items you can buy and sell at the same time. This is where you make your troops,The higher the level both the amount of troops you can queue to produce and the better kinds of troops you can produce as long as the other requirements are met ie things researched in the academy. The warehouse is built to protect your resources when you are attacked.This building is of no real use in the game so you only need to build it to to do the quest then it can be demolished to make way for another barracks. 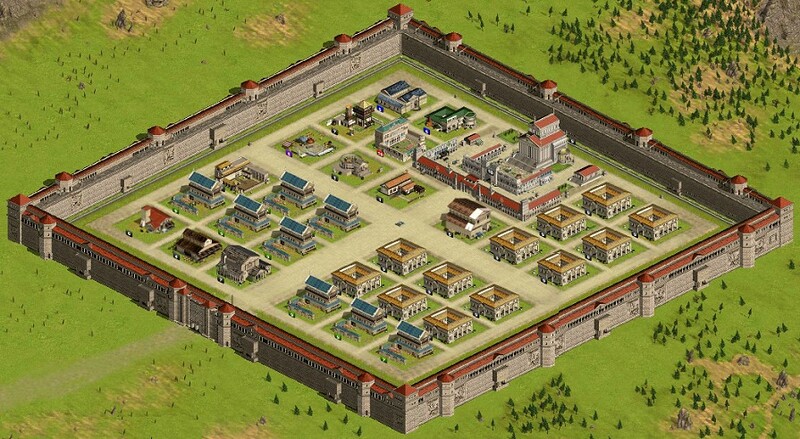 The stable is required to build cavalry and cataphract but is also a requirement for researching Horseback riding in your academy.The bigger the level of your stable the higher level you can research.Once you have done both level 10 horseback riding and build your relief station you can demolish your stable and build another barracks in its place. The embassy has a 3 main purposes in the game which are listed below. 1 You must have an embassy to join an alliance this can be done when it reaches level 1. 2 You must have an embassy to start your own alliance,this can be done when your embassy reaches level 2 and the bigger the level the more members you can have in your alliance. 3 You must have an embassy to allow reinforcements into your village when your being attacked again the bigger the embassy the more reinforcements you can accept. Some people dont have embassies in every village but if you choose to not build one and you are attacked then no one can reinforce that particular village to help you but its your choice. The purpose of the relief station is to speed up your troops when moving them between your own villages or while reinforcing or sending resources to other members within your alliance. This is where you do all your research and need to be built to a good level quickly and early in the game to allow you to strengthen your attack and defence but also increase production and speed up things such as building times. This is where you upgrade your armour for your heroes and is one of if not the most important building in the game.The higher the level of the workshop the higher the level of gear you can research and this means the stronger the heroes you will have.Look in the section hero gear and stars for the full information of what is done in the workshop.